Christmas is fast approaching! Next week begins my baking week - and I have more trays to do this year than I've ever done. Making my list is starting to get nerve wracking - I need HOW MANY bags of Chocolate Chips?? Aaaahhhh!!! To help alleviate my stress, I have a super quiet and simple card to share today. I off stamped the snowflakes behind my diecut, so that they weren't quite as dark, and I stacked three die cuts together, to give my word a bit of dimension. The stacked word and the berries were coated with Wink of Stella to give them a bit of "frost", and then some snow and ice was added with a bit if glue and glitter. PS. Stampin' Up! is cleaning out their warehouse! Some items are retiring, and some are just on AMAZING deals right now! Be sure to check this out - Up to 60% off - but items are limited, so get your order in now! 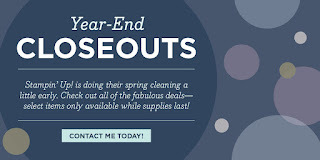 Click "Shop Now" and then click on "Year-End Closeouts" in the menu on the left. 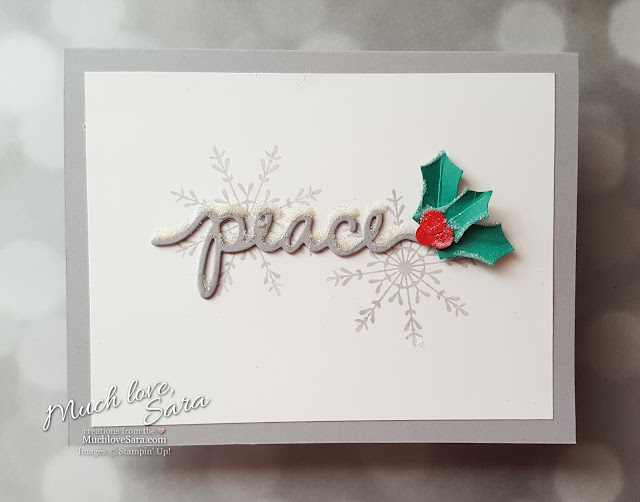 Labels: Christmas Cards & Projects, Christmas Greetings Thinlits, Holly Berry Builder Punch, Stampin' Up! This is beautiful, Sara! I love the simplicity of your layout and the pop of color with the holly.